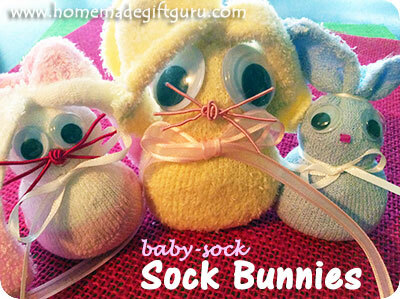 Sock rabbit baby bunnies are super stinkin' cute!... that much is clear. ...The ones that get separated from their match by the sock monster, who apparently loves to eat baby socks above all other socks. If you don't have baby socks lying around that's ok! You can find them at thrift stores and dollar stores, making this a fun and cheap homemade gift idea. 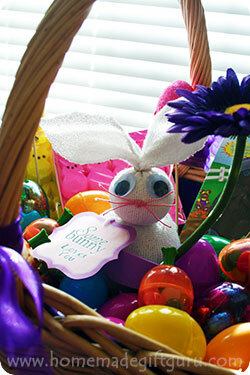 Sock bunny babies are also especially F-U-N sock animals because they are the perfect size for hiding in large plastic Easter eggs. 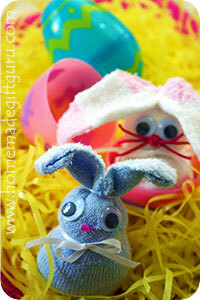 They make a fantastic surprise for Easter egg hunts! 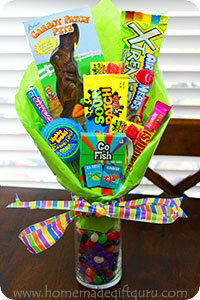 ...Or, they can be nestled inside Easter baskets for a unique treat. Another unique sock craft Easter gift idea? 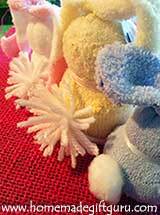 If you know somebunny that might like to make their own baby-sock sock rabbit, check out these fun little sock bunny craft kits. I used baby food jars for mine and they were a perfect fit! 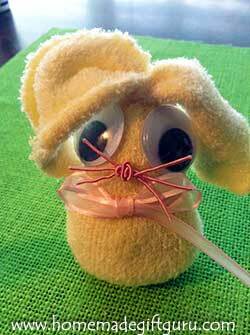 Below you'll find instructions for making your own Easter rabbit baby sock animals and more photos to warm your bunny lovin' heart. Most baby socks will work for this idea. I've used newborn baby socks through 6 month baby socks and they all worked great. As long as you fill them with about 1/4 cup rice (no more), they seem to fit inside the large Easter eggs perfectly. If you use newborn baby socks you will have to work the rice in with your fingers, but socks are stretchy so it's really no problem. Tip... I recommend a hot glue gun for both quicker and more permanent assembly. 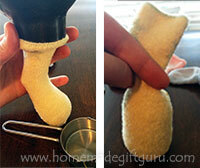 Use a wide mouth funnel to fill the sock with rice. Stretch the sock over a wide mouth funnel. 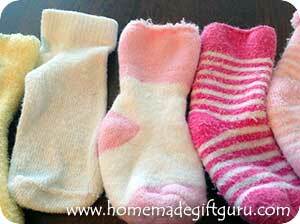 Fill baby sock with 1/4 cup rice. You may need to work it in with your fingers if the sock is on the smaller side. Squish the rice filled part of the sock into a ball and secure snugly with a rubber band. Use your fingers to mold the ball of rice into a body and head. Secure the neck with a rubber band... not too tight unless you want a bobble headed baby bunny. You can cover up this rubber band with a bow or scarf. Cut the top portion in half vertically. Trim off the top corners of each strip and shape like bunny ears (in other words... a leaf shape). Make a cute little baby bunny face. My FAVORITE part! 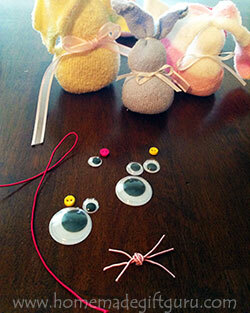 ...I like to use giant googly eyes for my baby sock bunnies! String or memory wire works great for the whiskers. Simply cut four strands of memory wire. Take one strand and wrap it around the three strands right in the center. This will hold the whiskers together and make a cute little bunny nose. ...Another fun thing to do is to make two big bunny teeth with white felt. This will give your sock rabbit a silly look. Your bunny still needs a tail! 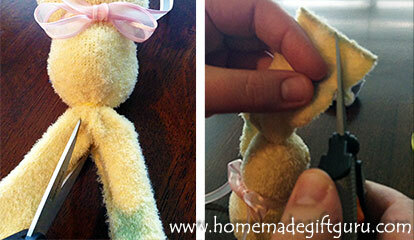 ...Use a matching craft pom pom or a cotton ball to make a little bunny tail. Or, I like to make my own pom pom tails using yarn. 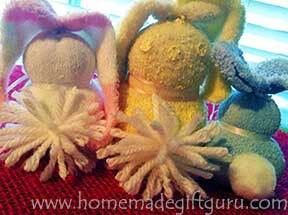 It's easy to make a custom pom pom bunny bum out of yarn. Wrap yarn around two or three fingers several times. The thicker you wrap, the thicker the pom pom will be. I made a rather loose pom pom here, you can wrap as thick as you want. Locate the center and wrap a piece of yard around, securing with a knot. Cut through both sides of loops right at the end of each loop. Fluff pom pom. Glue to bunny bum for a cute little bunny tail. You are all done! 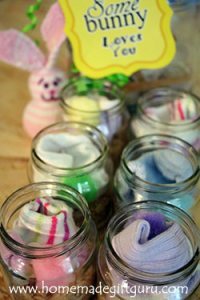 Give your homemade baby sock rabbit inside a large Easter egg, in an Easter basket... you could even slip one in a Christmas stocking, if you know someone who just loves bunnies. 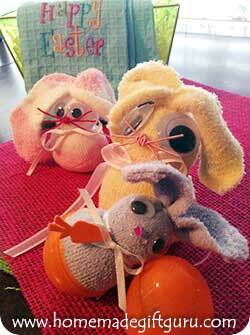 Make Sock Bunny Craft Kits!